Cortisol levels normally fluctuate throughout the day and night in a circadian rhythm that peaks at about 8 AM and reaches it lowest around 4 AM. 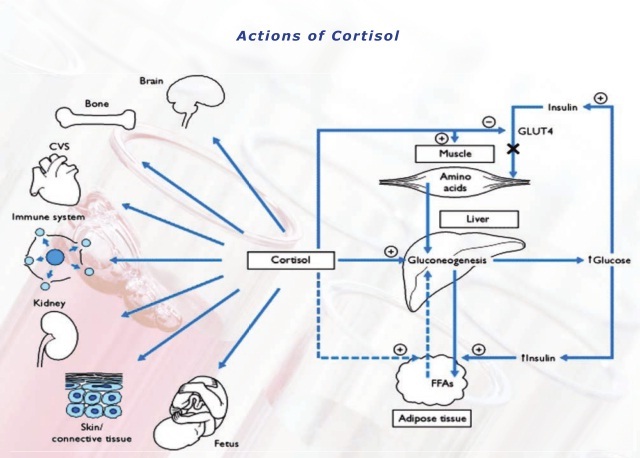 While it is vital to health for the adrenals to secret more cortisol in response to stress, it is also very important that bodily functions and cortisol levels return to normal following a stressful event. Unfortunately, in our current high-stress culture, the stress response is activated so often that the body does not always have a chance to return to normal. * This can lead to health problems resulting from too much circulating cortisol and/or from too little cortisol if the adrenal glands become chronically fatigued (adrenal fatigue). How are Cortisol levels tested? Cortisol levels are detected through a simple Saliva test. Saliva samples need to be collected at four different times during the day, and a record kept (for that day) of activities, events and foods eaten. An information sheet will be provided for you to complete. Saliva Cortisol testing should be undertaken in conjunction with your health care practitioner. If you require assistance in locating a practitioner near you, please contact us. Salivary hormone testing has been used in research for over 50 years and is a highly sensitive validated technique. It has the benefit over serum testing that it detects predominantly unbound, active hormones, which are biologically available to their receptors in target tissues. It has a convenient, pain-less and stress-free collection procedure, that can be performed in the privacy of the home. In addition, salivary hormones are stable at room temperature and samples can be collected at any time of the day and at multiple time-points; a benefit especially important for hormones that have circadian or monthly rhythms.